Too blessed clever for me! Well done. Super. Difficult to capture this natural display with a still camera but you've pulled it off to perfection with some expert work in post processing. That worked well! Its a shame multi-exposure in camera doesn't have dark priority mode (like one other nameless make) but you have come up with a good solution. Well timed as well to get the even spacing. Thanks all for the appreciation! It was a bit of fun; just need to improve on it sometime. Thank you Giulio, Nigel and David for your kind comments. And, Bill, for correcting me - you are correct it was Gary and that link. Will correct my info accompanying the image! A very original concept and great image. Congratulations on POTW! Well executed and conceived shot. Derek - the technique is fairly simple. Put camera on tripod where there are birds circling around and fire the camera in rapid shot mode. I stopped after 14 shots. 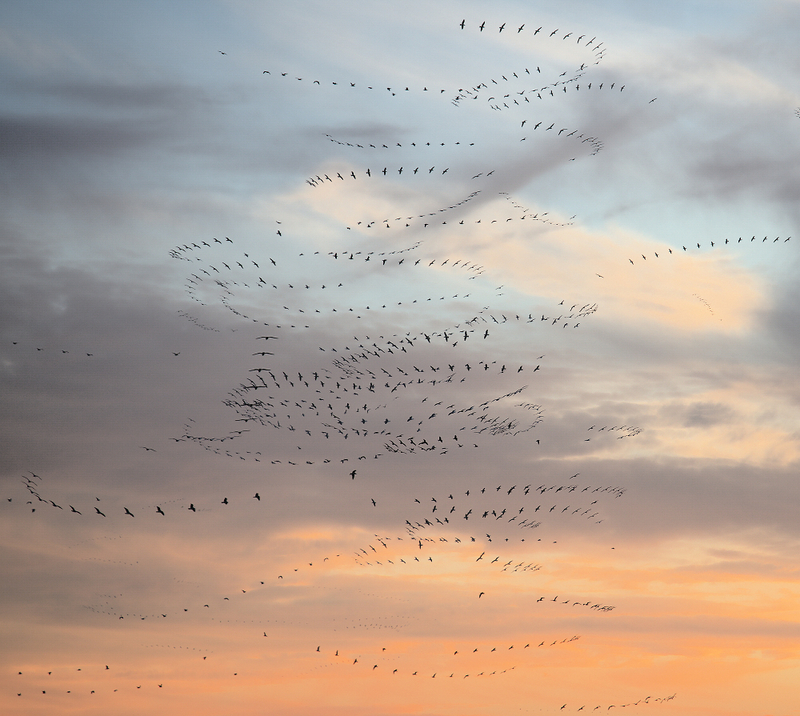 The photos were then stacked in a programme that allowed a blend mode that picked the dark areas to keep through the stack; hence the silhouetted birds caught at different moments in flight. Having produced one photo with the flight pattern it was then a matter of using curves to brighten the sky a bit. The programme I used is a little known one that is (I think) available for free now as the developer has sort of stopped developing it/ having a major re-think; Picture Window Pro. For some reason although I took 14 shots, only 13 birds appear in each run; not sure what the programme is doing with the last shot! I should probably try the stacking with something like serif's Affinity Photo, or ACDSee that I use. As RobL and Bill have mentioned above, it would be great of Pentax added another option in their composite shooting mode that added 'dark' to the bright/ additive/ average that they give us. Then this effect could be done in camera. Well deserved POTW. Very well conceived and executed. Thanks for the explanation on how you achieved it.